Subtext goes here.... Can you dig it? Imaging is optimum when the projected image is exactly bordered by our Infinite Black™ velvet borders, providing a significant contrast enhancement together with a real focus on the image. With the varying aspect ratios of movies, the True Aspect Masking screen masks to adjust the black borders of the image to its actual size. 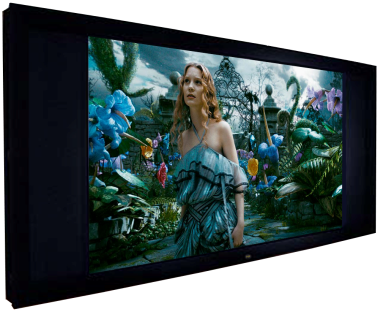 The True Aspect Masking screen is an acoustically transparent projection screen using the Enlightor 4K screen fabric, provided with automated masks controlled electronically for a complete, versitile masking with any home automation system. It can also be simply controlled by IR or RF remotes. The constant height (CH) screen uses two independent lateral acoustically transparent masks. It is therefore the ideal match with anamorphic lenses which expand a 16:9 native aspect ratio to 2.37, or for zooming "scope" ratio content which varies up to 2.40. We construct the screen to be able to mask up to 2.40, but will as a standard set the outer limits of the motors at 2.39. Exclusive to Seymour-Screen Excellence is that the frame width is exactly the same (3.75") as the Reference Fixed frame screens, due to it utilizing the same frame profile. Only a slightly rearward extension hides the motor and masking assemblies, with the total depth being 5.8". When comparing automated masking screens, Seymour-Screen Excellence's TAM screens are the sleekest, most sophisticated available anywhere. TAM 2-L 96 96.0" 40.0" 104.0" 103.5"x47.5"
TAM 2-L 100 100.0" 41.7" 108.4" 107.5"x49.2"
TAM 2-L 110 110.0" 45.8" 119.2" 117.5"x53.3"
TAM 2-L 120 120.0" 50.0" 130.0" 127.5"x57.5"
TAM 2-L 130 130.0" 54.2" 140.9" 137.5"x61.7"
TAM 2-L 140 140.0" 58.3" 151.7" 147.5"x65.8"
TAM 2-L 150 150.0" 62.5" 162.5" 157.5"x70.0"
TAM 2-L 160 160.0" 66.7" 173.4" 167.5"x74.2"
TAM 2-L 170 170.0" 70.8" 184.2" 177.5"x78.3"
TAM 2-L 180 180.0" 75.0" 195.0" 187.5"x82.5"
TAM 2-L 190 190.0" 79.2" 205.9" 197.5"x86.7"
TAM 2-L 200 200.0" 83.3" 216.7" 207.5"x90.8"
TAM 2-L 210 210.0" 87.5" 227.5" 217.5"x95.0"
TAM 2-L 220 220.0" 91.7" 238.3" 227.5"x99.2"
TAM 2-L 230 230.0" 95.8" 249.2" 237.5"x103.3"
TAM 2-L 240 240.0" 100.0" 260.0" 247.5"x107.5"
TAM 2-L 250 250.0" 104.2" 270.8" 257.5"x111.7"